Peace Corps Director Ronald A. Tschetter officially announced his vision for a Peace Corps Foundation during a town hall staff meeting on October 23. The principal purpose of the Peace Corps Foundation would be to advance the Peace Corps' third goal of inspiring a better understanding of other cultures through returned Volunteers in America. 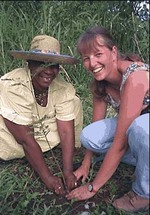 The Peace Corps Foundation would be a private charitable non-profit corporation. The goal of the Foundation is to increase public awareness within the United States of Peace Corps Volunteer experiences, and the diversity of the countries in which they serve. Groups such as the National Peace Corps Association and the numerous "friends of" groups comprised of Returned Volunteers could greatly benefit from Foundation resources. The Foundation would not be a federal agency; therefore it would not require any appropriated funds from Congress. Instead, funding for the Foundation would be sought from corporations, foundations, and private individuals; grants would be disseminated for specific programs under a governing board's direction. The activities of the Foundation will be planned in coordination and cooperation with the activities of the Peace Corps. "The Peace Corps Foundation would foster greater participation and support to Returned Peace Corps Volunteers and their organizations, encourage cross-cultural exchange, volunteerism through community events, classroom visits, and other educational activities. We now seek support and authority from Congress on this key priority for our agency, and I look forward to moving ahead on this initiative as soon as possible," said Peace Corps Ron Tschetter. Read more. More than 5 million southern Sudanese were displaced by war. Up to 90 percent of the population cannot read or write. Ten miles of paved road exist in a region the size of Europe. And diseases eradicated elsewhere in Africa, such as sleeping sickness and guinea worm, flourish. "Both health and education are critical to the needs of the returnees," Reed said. They are also the "least controversial" types of aid that can be given to a country still recovering from political strife, he added. Reed directs this and other humanitarian efforts from a four-bedroom house he shares with other international-development agency staff members in Juba, the capital of southern Sudan. Since the program started in November 2005, about 100 doctors and educators have given up Western salaries and living conditions to return to Sudan for three months of service. In Sudan, the reception has not always been rapturous. "Sometimes there are attitudes (like), 'Who are these people coming back who were living these cushy lives while we were suffering?' " Reed said. "But the Sudanese government has clearly recognized the importance of (returnees) and the skills they bring." Reed said the proof of this is in the outcome: Almost 50 percent of the volunteers have since returned to Sudan, and several have stayed permanently. One volunteer, a doctor from Tennessee, is now the deputy director of southern Sudan's National HIV/AIDS Council. A Texas professor has become a minister in Sudan's fledgling government of national unity. Read more. Read more about Peace Corps Ethiopia. Read more about the Peace Corps and NGO's. Read more about the Peace Corps and Service. Caption: Allan Reed and wife Ayo Reed pose next to Sudanese art which represents Dinka tribal life. 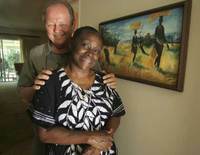 They met when she was working as a nurse in Sudan in 1972 and were married in 1974 and are preparing to return. Members of the Untouchable castes in Nepal are considered to be "impure" and "untouchable," and are restricted from entering the majority of community temples, have separate water supplies, and are deemed taboo to touch or be touched by. They are born into these roles, and have extremely limited opportunities to move ahead, living day-to-day, hand-to-mouth simply to survive. At the Himalayan Healers project we are training sponsored members of the Untouchable castes to become "Himalayan Healers" in the arts of Ayurvedic, Tibetan, and Indigenous/Nepali massage techniques, supported by a foundation in Yoga, Meditation, and Reiki. While the initial focus of our work and our mission at Himalayan Healers is upon providing a credible, positive, effective avenue of social and individual change within the Untouchable community of Nepal, we also recognize that Nepal is a nation in need. As such, our doors are open to provide assistance to qualified candidates from all backgrounds within Nepal, with a particular emphasis on those who are: Victims of Human Trafficking; those who have been Internally Displaced due to the Ongoing Conflict; Freed Kamaiyas (indentured servants and bonded laborers); and any others of Profound Need. Read more. 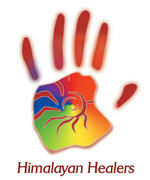 Visit the Himalayan Healers web site. Read more about what RPCVs who served in Nepal are doing today. The Mission of Orphan Support Africa is to support communities in Africa through WORKING WITH effective and sustainable programs, which improve the well being of orphans and vulnerable children and nurture these children to become self-reliant adults. By 2010 there will be 20 million OVC in Africa, while today only 10% are receiving any kind of service. In Malawi alone, the 4th poorest country in the world, with a population of under 12 million, There are nearly 1 million orphans. Orphan Support Africa is making a difference. It developed from two successful OVC systems of care. 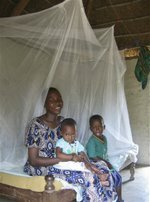 The Malawi Children’s (MCV) began delivering comprehensive services ten years ago in a structure that was replicated by The Mango Tree Orphan Support Programme (TMT) in southern Tanzania three years ago. Currently these two organizations serve almost 8,000 OVC in 66 villages. Each delivers services at roughly $30 per orphan per year. Each has a staff made up mostly of volunteers. Orphan Support Africa is a new organization with deep roots. It's five founders have a combined history of over one hundred and fifty years of commitment to sub-Saharan Africa and have already established community based orphan care programs in Malawi and Tanzania which have become recognized as best practice models. The lessons that have accompanied this experience are many, but can be boiled down to a simple unifying principal: Orphan Support Africa is in the business of saying goodbye. Each time Orphan Support Africa commits to help a community, it does so with the firm understanding that our role is nurture, not to direct. We present community leaders the opportunity for three years of support and resources that will allow them to develop to the point of self-sufficiency. At the end of that period it is mutually understood that communities will have evolved the leadership skills and commitment that will allow them to continue on their own. Malawi Children's Village is a social services organization run collaboratively by American volunteers and local villagers. It is on the outskirts of Mangochi, one of the poorest districts in one of the smallest and most impoverished nations in Africa. Malawi Children's Village provides food, medical care and money for school to more than 3,500 AIDS orphans -- those who have lost one or both parents to the disease -- in dozens of surrounding villages. Medical personnel treat the sickest and most malnourished children at an infirmary on the compound, but most of the work is done as outreach so that children can remain in their own villages where relatives or neighbors can help raise them. To learn more about "Orphan Support" in Malawi visit their web site. While working in investment banking in New York City in 2000, Greg Van Kirk read about Nobel Peace Prize winner Muhammad Yunus’ micro-credit work providing loans to the poor of Bangledesh. “When I turned 30 and read about Mohammad Yunnus’ work, I knew it was now or never, so I joined the Peace Corps,” he said. Armed with his investment banking credibility, and accrued analytic and business skills, Van Kirk knew that what he needed was real field experience. His transformation from Peace Corps volunteer to social entrepreneur began in Nebaj, an indigenous, rural town in the mountains of Guatemala, where he found himself surrounded by nature and culture but with no facilities or centers for tourists to stay at or visit. Seeing an opportunity to help local people bring new money into the community and create new jobs, he donated his own money and solicited the support of family and friends and created five tourism-focused businesses: a restaurant, a Spanish language school, a guiding service, an Internet café, and an artisan store. Van Kirk said Jan. 16 will mark the fifth anniversary of the tourism business and said the businesses have received about $10,000 in total donations to date and are now all locally owned and operated, directly employ over 30 people and have average annual revenues approaching $100,000. When it came time to create his own venture to build on the success of the tourism businesses, Van Kirk took into consideration the whole picture, using his heart and his head. Since he co-founded Community Enterprise Solutions in 2004, Van Kirk’s work has had a concrete impact. For example, thousands of women weavers and rural merchants with bad eyesight are now able to continue making a living by buying eyeglasses from Community Enterprise (CE) Solutions. The company trained and equipped local entrepreneurs, as featured in November of 2005 in the NBC Nightly News “Making a Difference” segment. 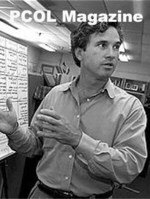 When summing up his work Van Kirk said, “It is the most challenging thing I’ve ever done, working with so many human, cultural, and societal issues, trying to come up with solutions to problems that have been around for thousands of years.” “In the end, my job is to drive myself out of business. We train people and get them to the point of self-sufficiency; to the point where they don’t need us anymore,” he said. Read more about the Peace Corps and Microfinance. "The fact that we buy wind turbines from Denmark and not from Cleveland may be absurd, but it is no accident because until now America as a whole hasn't really been serious about creating a new energy economy. Meanwhile, actions by individual states give some clue about how forward-thinking energy policies can create good jobs. " 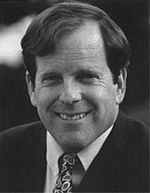 Sierra Club President Carl Pope served as a Peace Corps Volunteer in India in the 1960's. Read more. The Alliance will promote a new vision for American public policy -- creating jobs by promoting smart energy solutions to global warming; reducing the risks from toxic chemicals in the workplace and the community; and building a responsible trade policy for America. This unprecedented alliance will chart a new direction for the nation's labor and environmental movements, bringing together almost 2 million members around a shared vision of the future. Read more. "We don't have the luxury of waiting for an administration in Washington that can read a thermometer. We can flex our muscle at the state and local levels, challenging our elected leaders to greater creativity and resourcefulness in cooling the planet. Global warming is a big challenge, but it's one each of us can do something about starting today." Read more.